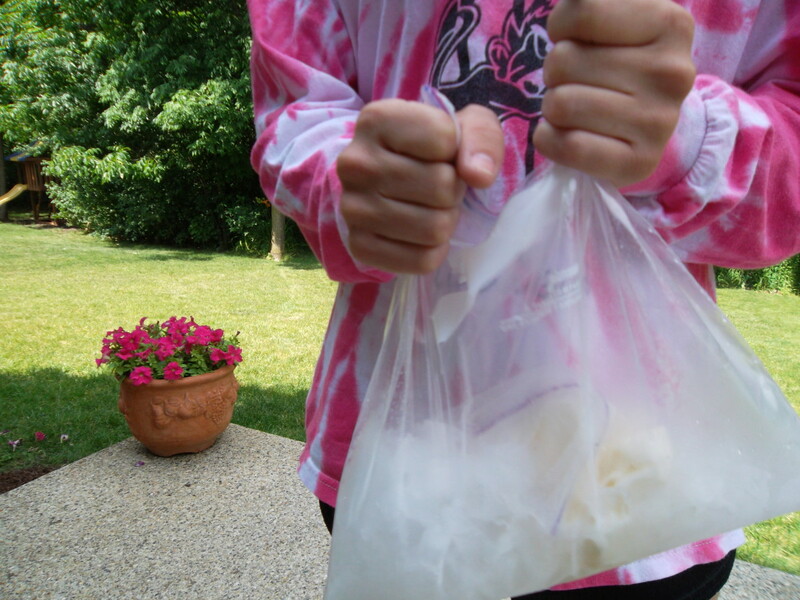 Homemade Ice Cream in a Bag in 10 Minutes! If you've never made homemade ice cream in a bag, you HAVE to try it at least once; and trust me, if you make this easy and versatile ice cream recipe once, you're sure to make it again and again - it's that delicious! Pour half & half, sugar and vanilla into a Ziploc sandwich bag; zip the bag closed; set aside. 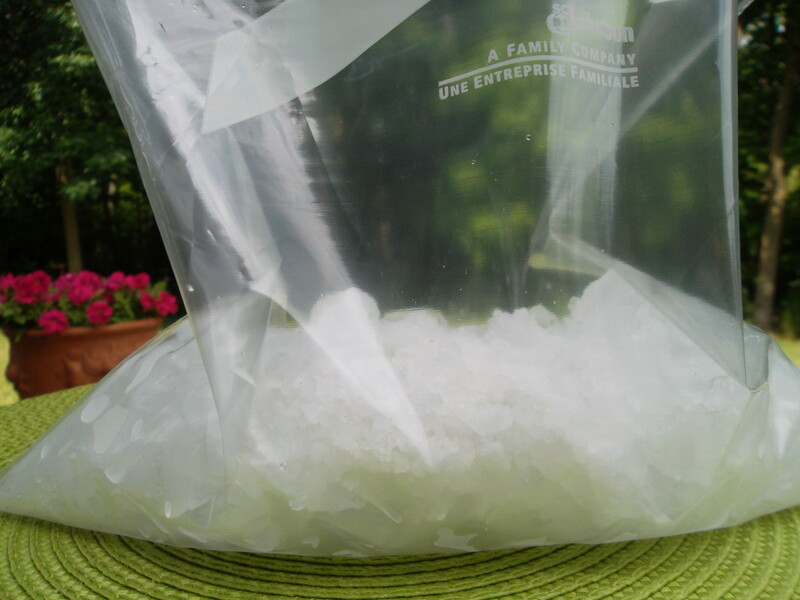 To the Ziploc gallon bag, add crushed ice and rock/ice cream salt. 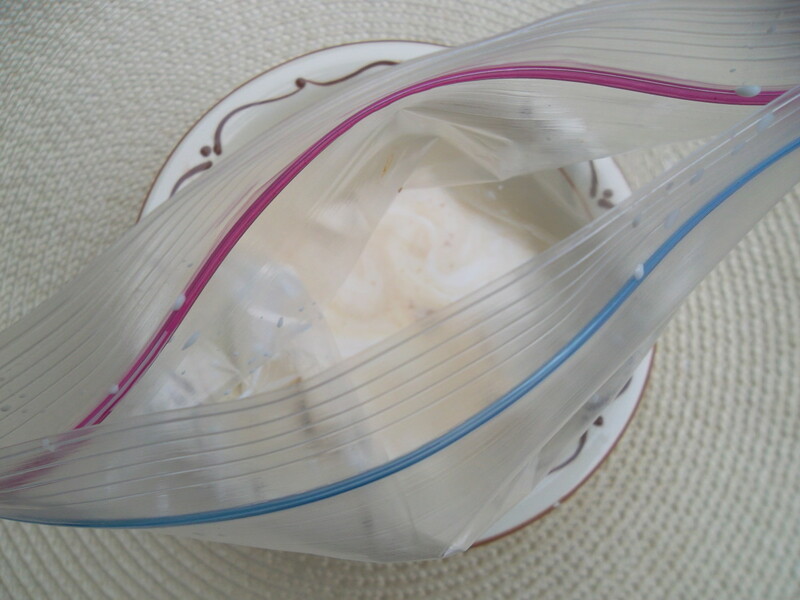 Put the sealed sandwich bag inside the gallon bag; zip the gallon bag closed. Shake the bags for at least 5 minutes; when the ice cream feels slightly firm, it's done. If desired, add other ingredients like chopped strawberries, chocolate chips, crushed cookies or candy bar, to the small bag and shake for another minute or two. As a kid growing up in the northeastern U.S., eating ice cream was a year-round affair, not just an indulgence of summer. While store-purchased ice cream certainly was not a novelty in our home, homemade ice cream sure was. I remember the first time I ate homemade ice cream at a friend's birthday party. We each took turns cranking the handle on an old-fashioned ice cream freezer and then got to enjoy the tasty and creamy fruits of our labor. 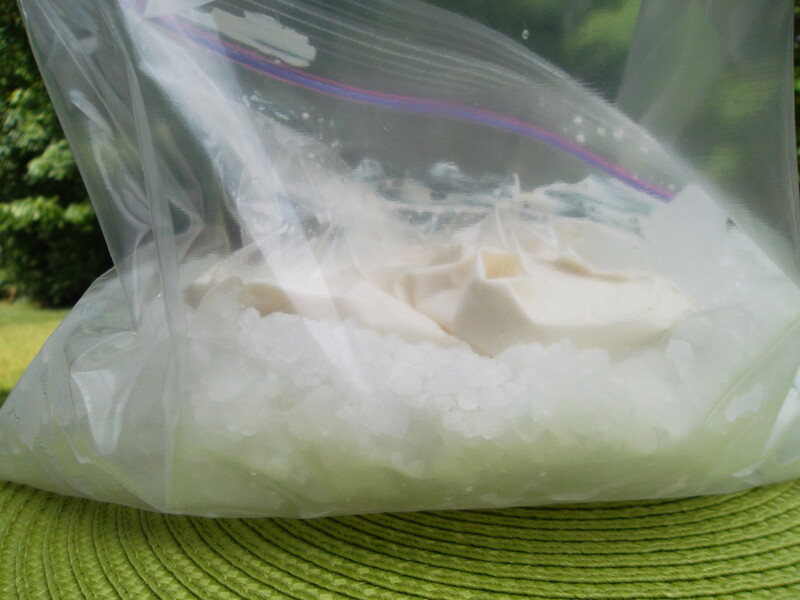 Strangely, that was the one and only time I have eaten homemade ice cream in forty-five years of living; that is, until my daughter brought home a science experiment from her high school chemistry class for ice cream in a bag - not a bad homework assignment if you ask me! If you watched the video above or have made homemade ice cream before, you may be wondering how a liquid like half & half can turn into ice cream simply by moving it around in a bath of ice and salt. The ordinary freezing point of water (H2O) is 0 degrees Celsius. 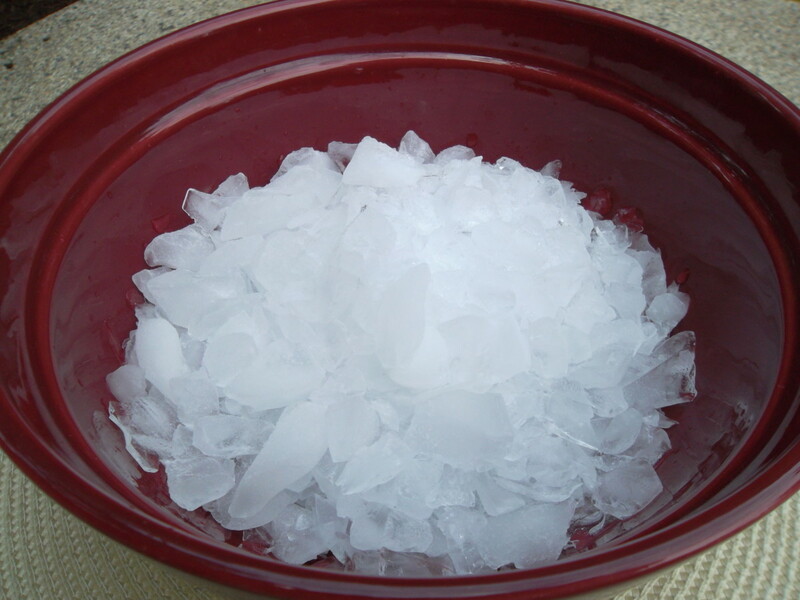 When the compound salt (NaCl) is added to the ice, a phenomenon known as freezing depression occurs. Simply put, freezing depression means that the temperature at which freezing occurs is lower than ordinary. Salt lowers the freezing point of water to a maximum of -18 degrees C., causing it to both freeze and melt at lower temperatures than normal. Recall from the ice cream in a bag recipe that a smaller bag of liquid cream is placed inside a larger bag of ice and salt and then shaken. The salt/ice mixture draws heat away from the cream mixture and maybe even your hands holding the bag. Rock salt or ice cream salt has larger crystals than ordinary table salt. 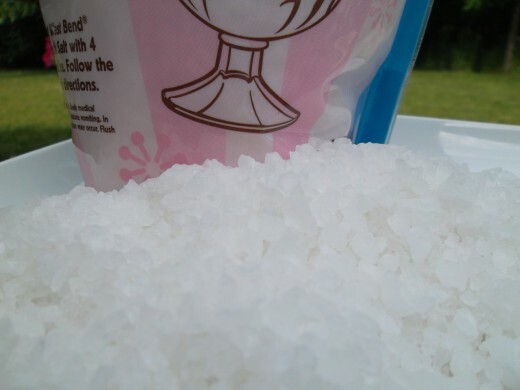 Not only do the larger crystals of salt dissolve more slowly in the ice water, but they allow for more even cooling. The shaking of the bags helps to make the ice cream consistent and creamy! Is there something that you can use instead of of using vanilla extract? I never knew you could make ice cream in a bag! Why have I messed about with freezers and churning for so long. Thanks Lionrhod.To answer your question, no I've never had any problems with the plastic bags I use (Zip Loc brand) tearing from the ice or salt. Brilliant idea! Love this hub. Are the strength of the bags a challenge? My first thought was that the ice/salt might puncture the smaller bag. This hub has started a discussion in our house. My husband doesn't believe it will work. I know it will because when I was young we made ice cream out of snow and rock salt. The ice cream here in Brazil is really expensive for the good stuff. I am looking forward to trying this, my mind is now on over-drive thinking of the different recipes to try. Thank you so much. Voted up and Useful. I tried this with solid CO2 - it worked really fast, but it made fizzy ice cream! 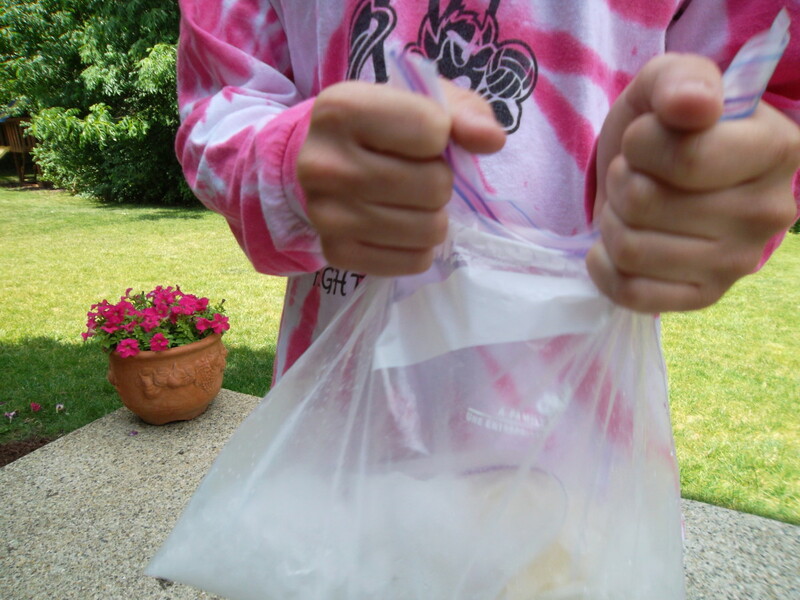 I remember making homemade ice cream in a bag with my chemistry class in high school, believe it or not! I'm the only one who chose to make vanilla as opposed to chocolate or strawberry because it's second to coffee as my favorite flavor. I am on the shake diet not-to-be-named and I bet it would work with the already mixed shake (without ice). 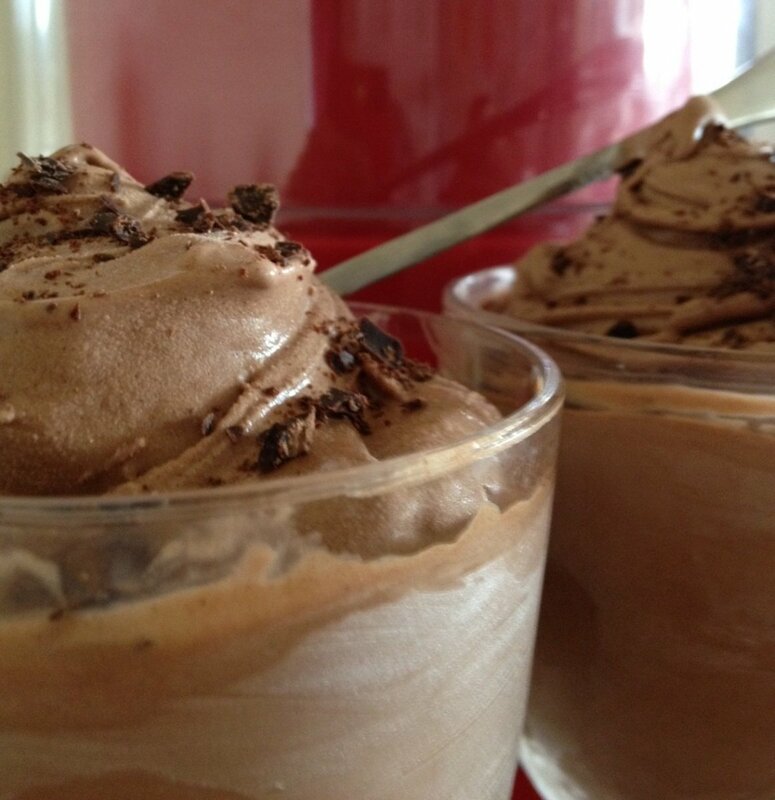 It's something to enjoy if I have a hankering for ice cream because it's low calorie, low fat, and sugar-free! Wow - Thanks for letting me know that and for thinking to use my Hub to help out. What a great science fair project; I'm glad the judges liked it too. I'm still sort of amazed myself each time I do this, how quickly you can turn cream into ice cream. Thanks again - sounds like a fun class you teach! Ktrapp, I wanted to let you know that I used your hub for two of my students' science project. They thoroughly enjoyed doing this, and got compliments from the science fair judges that their ice cream was the best of three other projects that also did homemade ice cream. Your instructions were very easy to understand. Thank you so much!!! 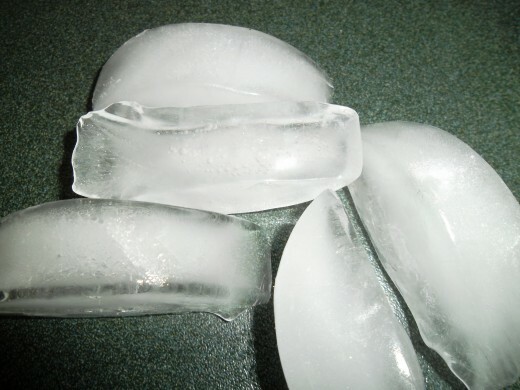 Vicki - "Ice dessert!" That borders on blasphemy. I just checked my 1/2 the fat Edy's that I just bought, and luckily it says ice cream. I checked the ingredients and it definitely has cream - phew! Thanks for your comment; I'm glad you liked the photos too. This is a fabulous Hub - very well done! I will try it ASAP. 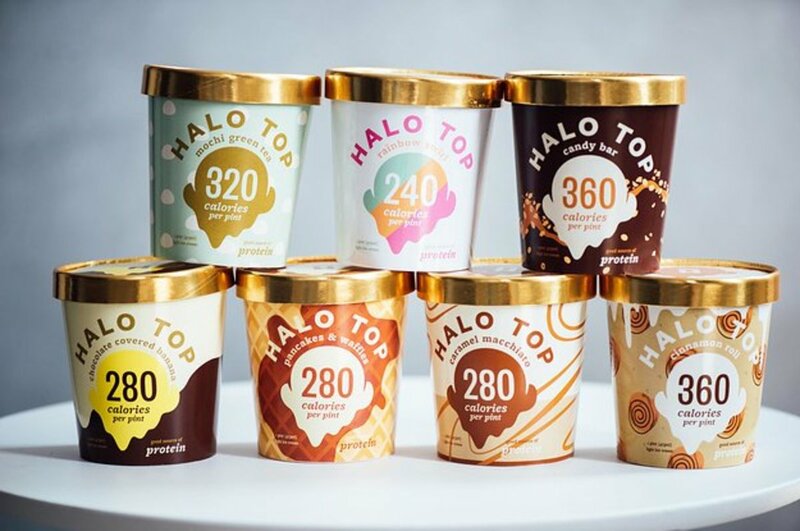 I am really ticked off with bought ice cream now - have you noticed they have to call it ice dessert, because it is no longer ice cream? Just look at the labelling. I really don't like all this tinkering around to put extra junk in our food. Lovely pictures too. Thanks ishwaryaa22. I'm glad you found the video and photos to be helpful for this recipe. Hopefully you will get the chance to make ice cream in a bag yourself sometime, especially since you like ice cream so much! An unique recipe! Your video, instructions and photos are clear and helpful. The scientific details are engaging. 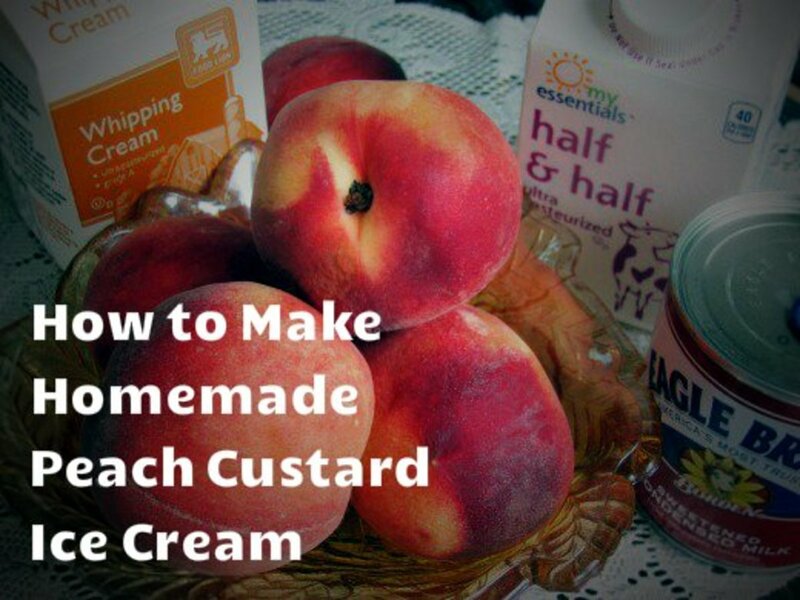 I would like to try this easy to make recipe as I am a big fan of ice cream. Belated congrats on the HOTD. Well-done! 6 years ago from Somewhere in MO. Yummy! Tasty treat. I'm loving it! I'm glad you liked the recipe-step photos, teaches12345 and thank you. What a novel idea! Love the photos showing the recipe steps -- yummy. Congrats on the HOD and thanks for sharing. Clearly any teacher that will let her class full of five year-olds make ice cream in a bag must be amazing! I bet every kid in your class remembers that day. She was amazing. She only just now retired and I'm 24! Learning in Life - What a great kindergarten teacher you had to do an activity/lesson like this! I learned how to do this in kindergarten. It is so much fun! Sunshine - The first I heard of ice cream in a bag was from my daughter's chemistry class of all places. we went ahead and tried it at home; I was doubtful that it would work, but amazingly it does. Thanks for stopping by. I never heard of ice cream in a bag until now. Thanks for the fun lesson of the day. Happy HOTD to you! Lrc7815 - Was that a pun? haha. Thanks for the vote and sharing. Hi Vicki. It was definitely a bit warmer outside when I filmed this than it is today, but it's not like winter has ever stopped me from eating ice cream :) Thanks for stopping back by. This is too cool. Voted up and sharing! I remember when you published this one. It's a good one! Congrats on HOTD. You deserve it! adrienne2 - You know what else? Not only can you make ice cream in a bag, but you can take the same concept and make it with two cans (a smaller one inside a bigger one) and then play kick the can until you have ice cream. Personally, I've never made ice cream in a can, but I think it would be an awesome idea for a kid's summertime birthday party. Thanks so much for your comment and votes. Junaid Ghani - Thank you so much. That's really kind of you to say. Definitely give it a try, NornsMercy. To me, it rates high on the "yummy" scale, especially with fresh strawberries. Thank you, Rusticliving. I had a lot of fun making that video with my daughter and dog :) Looking at if again makes me want ice cream too. Get THE HECK OUT!! Ice cream in a bag. Love this recipe, and the video is awesome. I can not wait to give this a try. Congrats on the hub of the day, totally deserve it. Have voted up, and bookmarked! seanorjohn - "Magical" is a great way to describe ice cream in a bag. I've made it quite a few times, and even with an understanding of the science, I am amazed each time the liquid cream turns to ice cream with some shaking. Thanks for your votes and for sharing this too. idigwebsites - Half and half, if you're not familiar, is half milk, half cream. I'm not sure where you're from, but in the states it can be purchased that way. It certainly does make a "yummy" dessert. 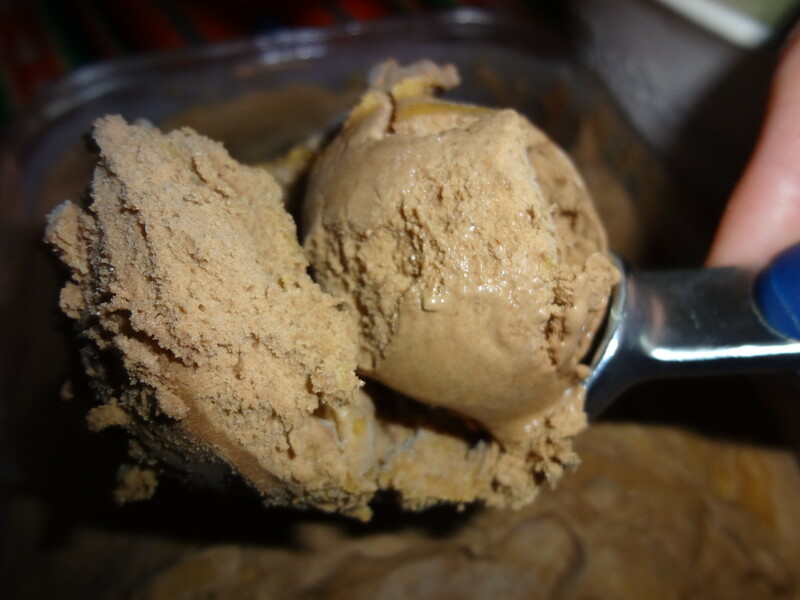 vnsatakopna - It's definitely easy to make this ice cream - just a few ingredients and a few minutes! RTallolini - Thank you so much, and what a great idea! Fantastic Hub! I really like it. Congrats on selection as HOTD. congrats well deserved award. Never realised there was such a thing as ice cream salt. Will definitely try this recipe. It still seems magical even though you expertly explained the science behind it. Voted up and useful. Will tweet this. Very interesting and sounds easy. Really worth trying out. Aha--I knew it! What a fun time for the award to come--at Christmas. Congrats. :) I was thinking that this might make for a bright day in a nursing home. Thanks so much prarieprincess. I've always had a soft-spot for ice cream. Really, it probably was only one of the desserts my mother bought. I loved every flavor from the store, except for peach and coffee. I appreciate your compliments. Thanks Mary. It's a lot easier to clean up than an ice cream maker. I have to say, that every time I've made this I'm always just as fascinated that it works! Thanks Thelma. You should definitely try it. Really the only thing out of the ordinary to get is the ice cream salt or rock salt. This is a great, fun idea. We should all have to 'work' or 'play' for our ice cream! It helps us burn off a few calories before eating it. OH, yummy, but I think I'll wait until summer to try this. Baby, it's cold outside, here! Ktrapp, this wonderful hub brought back memories for me. 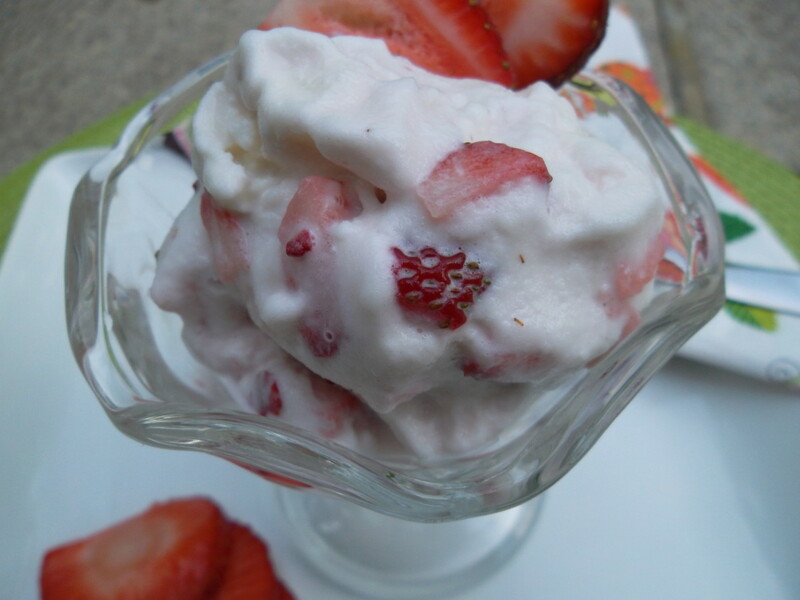 My Mom had a fascination with homemade ice cream and she was always looking for new recipes for it. She would have loved this! I definitely want to try it, and am impressed by your hub, which includes the science, too. Bravo! Congratulations on "hub of the day." Well deserved! Well, who would have ever thought of this??? First: Congrats on HOTD! I make homemade ice cream in a electric maker, but this method just fascinates me. I am bookmarking this one for sure. I voted it UP and will certainly share. Awesome! Congrats on the HOTD! You definitely deserved it. Thanks for sharing. I would love to try this. Thanks Jill. 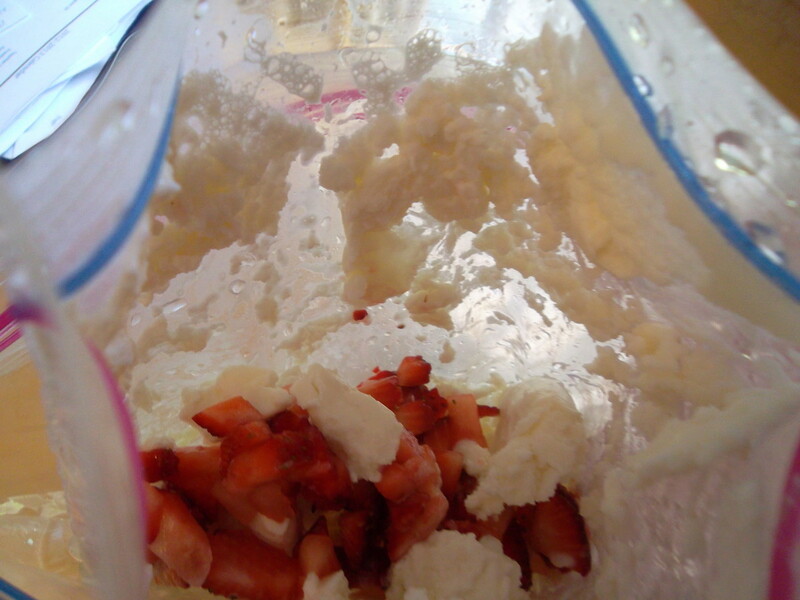 I was a bit skeptical when I made ice cream in a bag for the first time, but it does work and is a lot of fun. Thanks ienjoythis. I hope you like it. It's a lot of fun to make. So awesome!! I cannot wait to make this. Great hub, thanks!! Au fait - It might be good to add crushed candy cane at the end and make peppermint ice cream. Well, I'm going to have to try this, maybe for Christmas. I like to try new things and I really like quick and easy short-cuts that produce good results. OH YEAH! This recipe is great. I will be making this - the kids will love it. Yes it looks easy so I have book marked it .. would make it in summers. sweetie1 - Thanks so much. I believe an earlier commenter from the U.K. also inquired about half and half (half milk and half cream, as you discovered). I didn't realize that half & half was a U.S. thing. Anyway, I'm glad you enjoyed the recipe and hope you get to make it. Really enjoyed reading your recipe. So easy to make and looks mouth watering. I had to google what is Half and half as we don't get this in India but it can be easily made at home with cream and milk. voting it up and useful. It sounds like a lot of fun to make this on a camping trip with the kids (as long as you have access to ice). Ice Cream in a bog - who would have thought? (Except a smart science teacher). We have a camping trip planned this weekend - this just might make a great snack and game for the kids. I'm not sure where you live and the terminology used if it's another country than the U.S., but half and half is half milk, half cream. So basically if you use 1 part of whipping cream and 1 part milk that would be the equivalent of "half and half." I hope this helps. I really want to make this recipe but I can't find half and half at my place....what ingredient does the half and half have? I will try and make it at home if possible! Thanks nancynurse. I hope you like it, if you get the chance to try it. Thanks so much DzyMsLizzy. I wish I had know about making ice cream this way when my kids were younger. It would have been awesome to do at a birthday party. I've seen where you can also make this with two cans (instead of the plastic bags) and play kick the can to make the ice cream. Thanks for the stars and vote. great recipe I have to try this one. Thanks for sharing. Oh, what a fun idea! You could do this for a group of kids, each making their own,and putting their own choice of "add-ins." 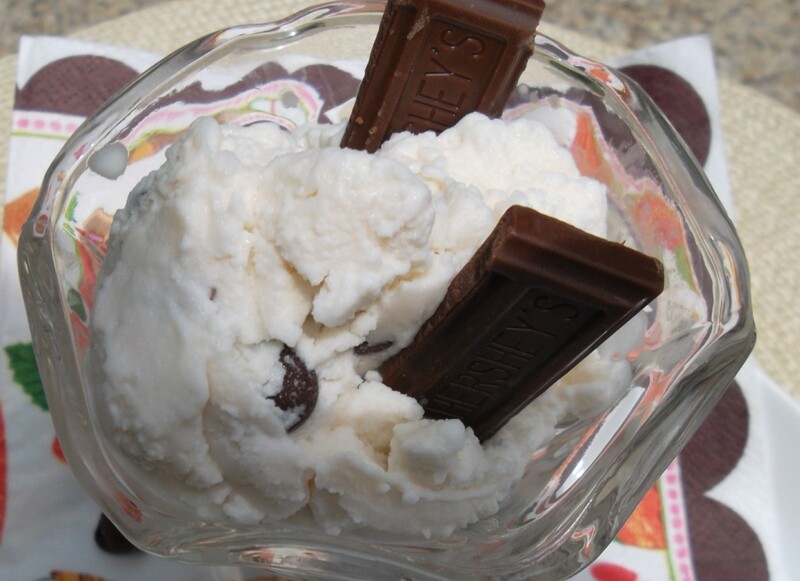 Tracy - I know you've been busy moving and getting settled, but if you get a few minutes you should try making this ice cream with your kids. It's easy, really good, and sort of fascinating. Thanks for the votes and comment. Thanks Happyboomernurse. I was pleasantly surprised with the contest win. I appreciate your "congrats" and pun. Thanks moonlake. That's really nice of you to say. Congrats on winning Best Family Recipe on this beautifully presented and fact filled hub. The video was also very cool (pun intended). I'm not at all surprised you won, great hub. Congratulations on your win. 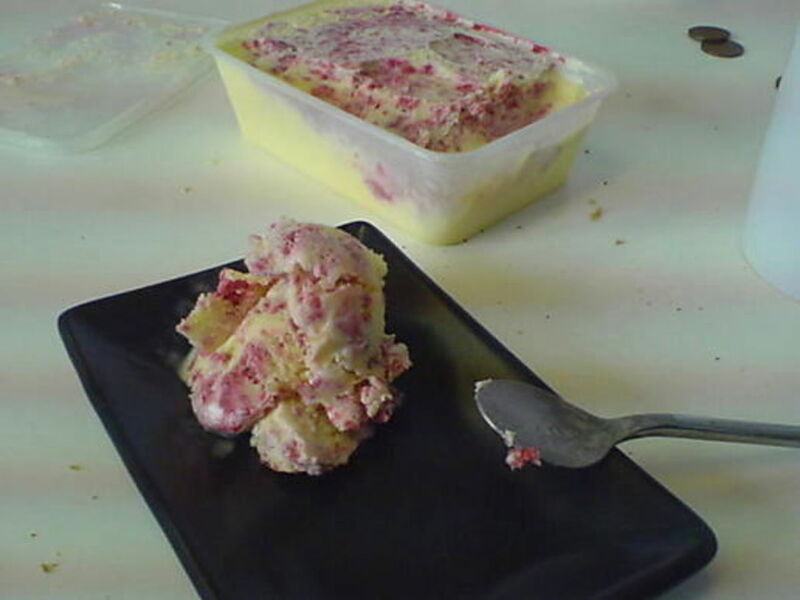 ausis - I would love to hear what you think of this ice cream made in a bag if you get a few minutes to make it. As a professional chef, I bet you might even come up with a few tasty variations or flavors. You're homemade ice cream must be spectacular! Hi As a professional chef I learnt to make ice cream but even before that back in 1977 or their abouts my Aunt use to make it in the big machine. Now days I have 2 ice cream machines I use with a bulk recipe. It uses a sort of old english custard mix, 3-4 egg yolks, 1.2 litres milk, 1.2 litres cream, 600gram sugar, gelatine & other stuff to make it just right. This recipe always pleases whips up perfectly light & creamy. WAY better than even the superior shop bought brands. MY one problem is, as with anything all good things take time. It takes 4-5 days to make this mix 5 litres of ice cream. Sometimes I want just a little so your recipe will come in handy for that without having to do all the extra work first. Hey Gordon - No apologies necessary at all. Oh, how I wish I wasn't a dessert person like you, but every now and then I can't resist. This ice cream is actually perfect though, since it's just the right amount; if you want seconds, you have to work for it! I'm glad you liked the video - thanks for letting me know and stopping by. First off are the million apologies for the delay in dropping by! So sorry about that - I've been away. I'm really intrigued. This looks amazing. I'm not normally a dessert person and not known for it but straight off the top of my head I know someone who would adore this and no doubt have many other friends who would also. Thanks Dan. Your congratulations is very much appreciated. Congrats on your well-deserved win in the cookbook contest!! This is surely a very family-friendly recipe. Thank you so much Purple Perl. I'm so glad to know that you liked all aspects of this recipe Hub. It was a lot of fun to put together, of course eating the ice cream was the best part. Thanks again. Loved your dog, and loved the ice cream! What a fun idea and delicious too! Innovative, and I liked the science behind the idea too! Congrats on your win, a truly well deserved hub. Voted up and I loved your video and pics. Pennylu - Thanks...I'm glad you liked the video. Hopefully it demonstrates that you really can make ice cream in a bag easily and with just a few ingredients. Roskika - Thanks for the congrats. 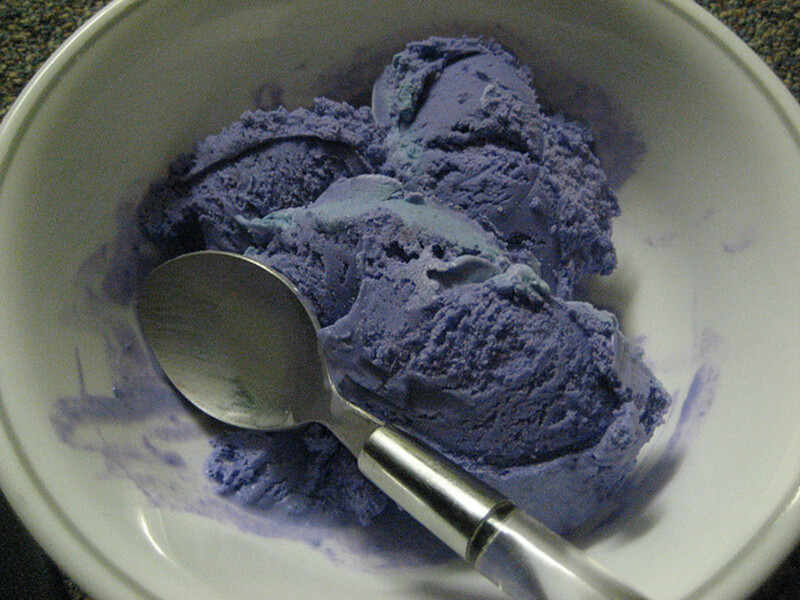 I hope you get the chance to try to make ice cream like this sometime. What an excellent easy idea, loved it...Thanks for sharing and congrats on your winning! Thanks for the tip Marntzu. It's always nice to have some available substitutes. Thanks jennzie. I don't know why, but every time I make it, I'm amazed that it works. Thanks for the vote up and share. Peggy W. - It's sort of crazy that you can make ice cream in a bag, isn't it? And it's an awesome way to teach science. 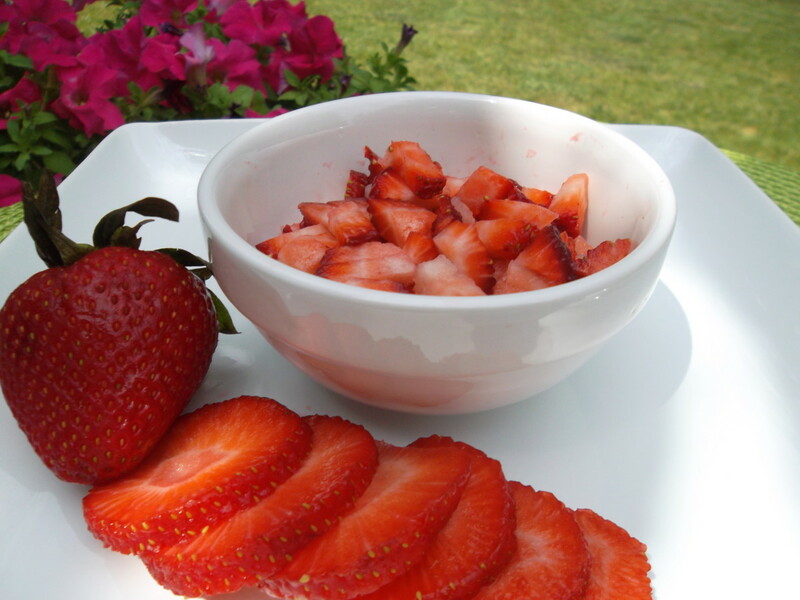 I just got some fresh strawberries so I think we are going to make some again tomorrow. And trust me, Ruby the beagle always gets her fair share :) Now that I think about it, I bet she would love to help you make some of your old fashioned cookies. Wow! Great ice cream maker! And, I loved the video. Thanks so much. I think you did a great job. Yum! You can use Kosher salt in a pinch too. Awesome recipe idea! I didn't know you could make ice cream in a bag- this looks delicious! Thanks so much Melvoy. 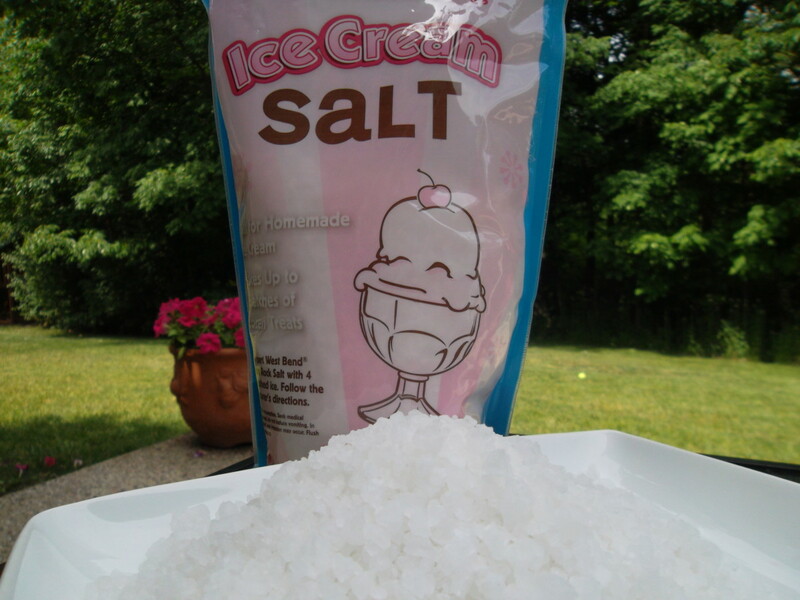 Ice cream salt really is just rock salt packaged so you get the idea to use it for homemade ice cream. If you cannot find either in the UK, you're probably right that you can get it on Amazon. Thanks again for the congratulations. Congratulations on your win. This sounds like such a fun recipe to make. I feel sure my daughters will enjoy this science experiment. I have never seen ice cream salt, but I expect it will be available on Amazon, even here in the UK. Oh wow! I didn't know that vespawoolf. How nice to hear the good news from another hubber and thank you for the congratulations. Congrats for winning the best family recipe in the contest! It's well deserved! Thanks cocopreme. It's a hot summer so hopefully this ice cream does the trick. Thanks for the Pin too.